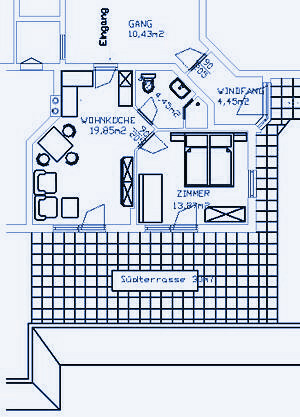 The size of our apartment 'blue' is about 45 sqm, offering room for 2 to 5 people. The apartment includes a terrace with a size of about 30 sqm. Additionally, one can book the separate room 'mint' in combination with this apartment - the dining area offers space for up to 8 people. The apartment 'blue' consists of a bedroom for 3 people, a convertible bed for 2 people in the living and dining room, a kitchen and a bathroom.